I don't want to write this recipe using the 50s-style of "1 can of X" but I'm honestly not sure of the measurements of the ingredients I used and of course I tossed all the packing. Thus, all measurements are approximate. However, that's the beauty of lasagna--whatever fits in the pan is usually the proper amount. Saute mushrooms in olive oil over medium-high heat until they have lost some of their moisture and are just beginning to brown, about 4 minutes. Add the onions and continue cooking until the onions are soft and mushrooms are brown, about 5 minutes. Add the garlic and cook for 1 minute. Season with salt and pepper. Steam frozen spinach for a few minutes in the microwave. Drain some of the excess moisture. Mix onion-mushroom mixture with the spinach in a large bowl. Set aside. Meanwhile, brown the ground turkey in the same skillet used for the onions and mushrooms, using additional olive oil if necessary. Season with salt, pepper, and basil. Mix egg with the ricotta cheese. Spread about 1/2 - 1 cup of sauce on the bottom of a greased 9 x 13' pan. 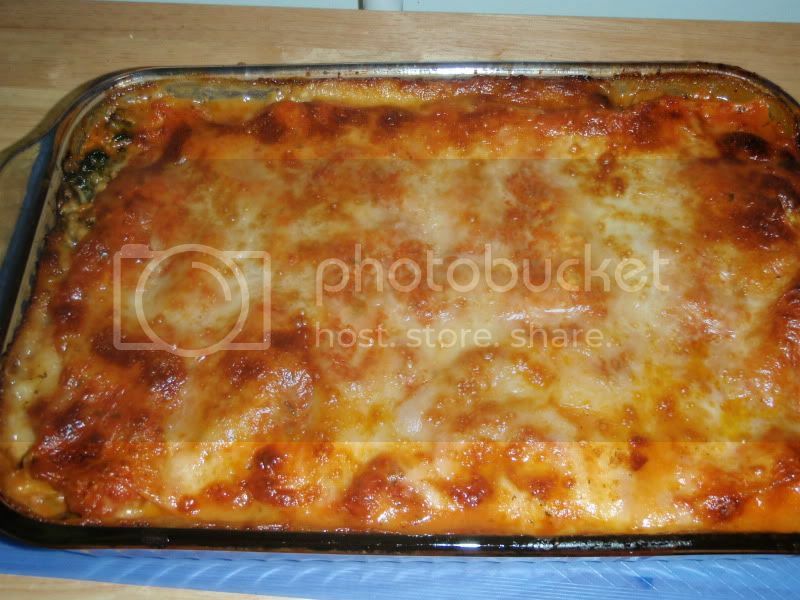 Spread about 3 T on the bottom layer of lasagna sheets and place cheese-up in the pan. Put 1/2 of the spinach mixture, followed by 1/2 of the ground turkey on top of the lasagna sheet. Dribble a few tablespoonfuls of sauce on top of the mixture and sprinkle with parmesan. Repeat for another layer. 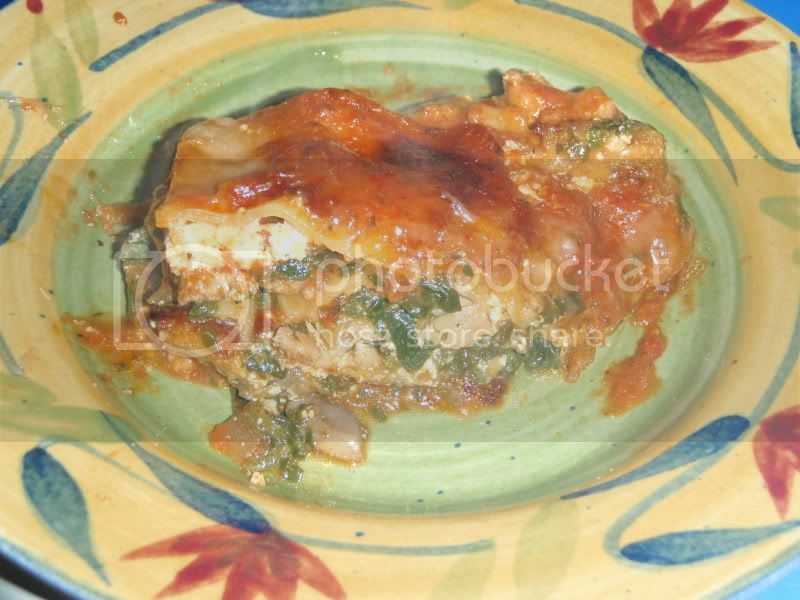 Coat the top layer with the remaining ricotta cheese and place face down on top of the second spinach-turkey layer. Spread remaining sauce on top and cover with the mozzarella cheese and any remaining parmesan. Spray foil with nonstick spray. Bake covered for 30 minutes, then remove foil and bake until well browned for another 20 minutes.